This is a pattern re-make! I was looking for an embroidery pattern that was small and simple – something suitable for a wee project that’s tumbling around in my head. Something…. simple. Simple lines. Simple shape. Not much to it. 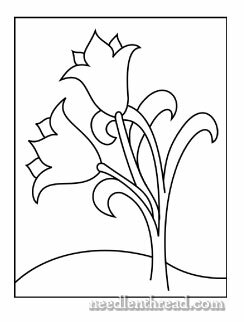 So I started filtering through the embroidery patterns here on Needle ‘n Thread to remind myself exactly what I have on here, and when I came to this Tulips a la Morris pattern, I realized it was exactly what I was looking for – but it was too big, and the lines weren’t quite sharp enough. I drew the older one up when I was tracing patterns with a tablet (which I still do, now and again!) So I revamped the pattern, cleaned up the lines, and shrunk it down to 3″ tall. Here’s a PDF of the wee tulips. The design prints at 3″ tall and about 2.9″ wide. If you’d like to predict what you think I’m doing with the design, feel free to leave a comment – and any other suggestions for stitching the pattern are always welcome! August 14, 2017 Fancy Floral: A Free Hand Embroidery Pattern! It is always a pleasure to read you first thing in the morning. I know how I will use your little tulips, on one of my quilts, I like small designs and this one will be perfect and for guessing what you will do with yours….. No idea, but I love surprises and will wait for your next article. I think the tulips surely have something to do with Easter. You mentioned on your Silhouette box project something about an Easter basket, so that would be 1 guess. Also, the tulips would be cute stitched onto an egg, fabric of course, not the real thing. Unless you have some new fangled machine for those too! Hmmmm….I’m guessing the cover for a needlecase or maybe for a special Easter card for someone? I would make a biscornu from the pattern. Since you introduced them, I have made 2 using crewel wool and one from some patchwork I had left from another project-they are fun and fairly fast to make. The tulips will have to be manipulated a little bit to be square but I think they could work well for an 8 sided pincushion. Hi Mary, I primarily do CCS and specialty stich work on linen and love using the wonderful overdyed silk (and cotton) threads that are available. I would appreciate seeing your take on using these threads on the lovely surface embroidery that you enjoy so much. Love your site with its many resources and I often recommend you to my stitching frinds. The time you commit to this is quite extrordinary. Many thanks! Love tulips & from downunder (fall) Easter lilies are the ones. There are countless ways to use this flower – see how Morris used the wild tulip on blue wallpaper at the South Australian Art Gallery site under M in the European & American collection – plus other pieces. Probably a little big for such a wee flower. So have you made up your mind, Mary. Perhaps a scissor holder. Thank you for your insights and introducing new ideas. Love reading it. I can see this in goldwork, with couched patterns on the tulips themselves. I’m thinking a wee book of some kind—maybe??? Thread maybe the overdyed Krenik from Threadworx? Wonderful Lady, it always seems when I become FUZZY in the head and cannot think what to do for a gift, here comes your daily e-mail to save me. I love getting them everyday, always brings asmile to my face. All very good guesses, everyone. Yes, needlebook is probably the route this is going – I started the project to test out some products, and then I’ll be turning it over to my niece to do with as she wants! She’ll finish it. Well – for a couple reasons: the first is time and the lack of it, and the second is that it’s not the kind of project I really want to be doing right now! But there are some really good ideas here! Emsley Rose – love the idea of goldwork, and I may just pursue that…. and Anne – I love the idea of four sides of a box. Hm. Maybe I could combine the two! You are probably going to use it for the 4 sides of a box. Would look stunning! will you cut out the design on heavy paper and then place it on the fabric and trace around it? What is the tablet you used to make the tulips smaller? Would like some info on it: cost, where is it available, etc. I actually used this pattern for a napkin made as a christmas gift. You can see the result here, http://www.flickr.com/photos/50029293@N05/5465820699/lightbox/. I´m not as good as you are with embroidery but I am still happy with the result. I made the pattern as bluebells or gentians instead of tulips. Oh, Very Pretty, Eva!! I love it!! I think you did a beautiful job, and I love the colors! Thanks so much for leaving the link. That made my day!